This 31 gram origami crane flexes its wings and stays in the air thanks to Rohm at CEATAC. Origami and technology go together pretty well. Lightweight, efficient structures... and animal shapes. But there's nothing more "origami" than the humble paper crane. Now, courtesy of a small, light, power-efficient microcomputer from Rohm (a Japanese company: don't let the name fool you), the crane can fly. Better still, it's remote-controlled and can even keep itself afloat for around five minutes, according to the spokesperson. It's almost the most Japanese thing here at this year's CEATEC. The tracer-bird was used for surveillance. The dark birdforms dotted the mountaintops like statues of prehistoric beasts, wings outspread. Had there been an eye to observe them, it might not even have noted their minute, tropism-like pursuit of the sun across the sky as they recharged their batteries for the night's flight. The day had beaten its way well on toward evening before they stirred, almost simultaneously, as if shaken by a sudden breeze. They began to flex their wings. 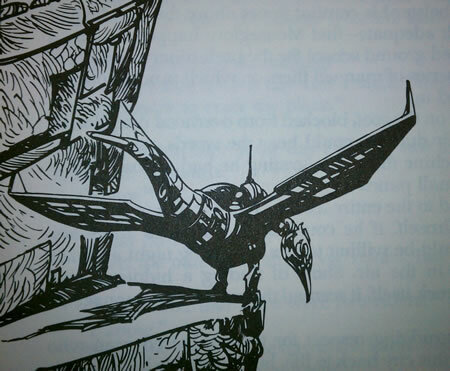 Fans of Greg Bear probably remember the beautifully detailed Little Bird surveillance drone from his 2003 novel Darwin's Children.